Hoodoos (odd-shaped pillars of rock) can be found on every continent, but here is the largest collection of hoodoos in the world! Most park visitors sightsee using the scenic drive, which provides access to 13 viewpoints over the amphitheaters. 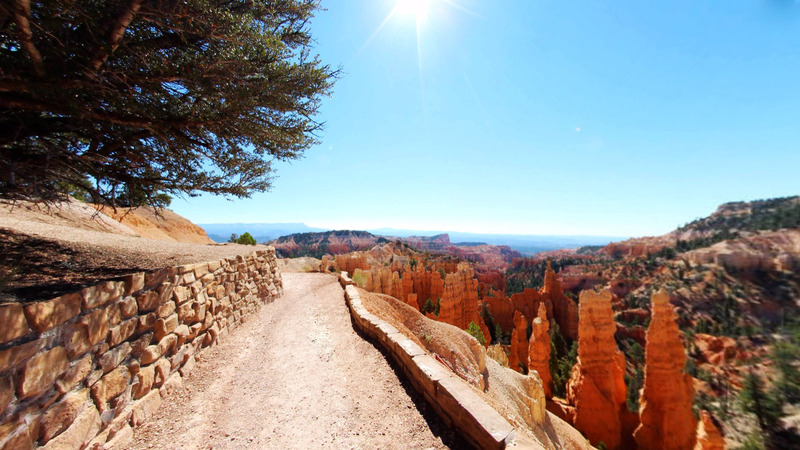 Bryce Canyon has eight marked and maintained hiking trails that can be hiked in less than a day (round trip time, trailhead). Several of these trails intersect, allowing hikers to combine routes for more challenging hikes. The park also has two trails designated for overnight hiking: the 9-mile (14 km) Riggs Spring Loop Trail and the 23-mile (37 km) Under-the-Rim Trail. In total there are 50 miles (80 km) of trails in the park. The park has a 7.4 magnitude night sky, making it one of the darkest in North America. Stargazers can, therefore, see 7,500 stars with the naked eye, while in most places fewer than 2,000 can be seen due to light pollution, and in many large cities only a few dozen can be seen. The air in the area is so clear that on most days from Yovimpa and Rainbow points, Navajo Mountain and the Kaibab Plateau can be seen 90 miles (140 km) away in Arizona. It begins at Fairyland Point, at the northern portion of the park, and takes you through spectacular hoodoos and scenery along the rim and into the canyon!